Let’s forget golf rentals and equipment releases for a while and delve into something controversial but still in the world of golf. A lot of us have this perception that golf is a boring kind of sport, but recently a certain traveler had the most horrible game of his life. Dougie Thompson, a British tourist had his leg torn open by a 12-feet crocodile. If this encounter hasn’t put you off, here’s a rundown of five courses around the world that can guarantee you a spine-tingling game. Literally a “scorching” course of its kind, this 18-hole golf destination is found in Death Valley, the planet’s hottest spot. It was named Furnace Creek due to its mercury content which can climb as high as 135 degrees Fahrenheit. Most often, golfers and ordinary visitors of Death Valley are rescued because of dehydration, and some are not that fortunate. Somewhat in poor taste, this risky golf course hosted the Heatstroke Open in year 2011 where 48 contenders faced the 115-degree Fahrenheit course. Luckily, they all survived. Other golf-themed attraction in Death Valley is actually a rocky salt pan that only Satan himself would dare to play around there. Situated at the grounds of Louisiana’s penitentiary, this American course was inspired from The Green Mile. Three-quarters of the inmates that are here are serving life sentences on Death Row. And yes, these prisoners established and managed the course since then, although they are not permitted to play. The tight security prison and the forbidden course would remind you of a cruel enough joke – the tee markers are in the shape of handcuffs, locked up. So if you’re one of those golfers who want to experience this unusual course, prepare to overcome your scelerophobic (fear of bad people) tendencies. Prior to any tee time requests, you must present your personal information 48 hours in advance for screening. Things such as maps, cameras and weapons are not allowed inside so you need to leave them at the prison gate before you can access the golf course. Hailed as “the world’s most exclusive golf course”, Pyongyang Golf Course is home to DPRK Amateur Golf Open and a controversial golf record – Kim II Sung’s extraordinary 38-shot with 11 aces during a round in 1994. This score stirred up the minds of golf enthusiasts though some might say it’s suspicious. Considering that score, Sung should have been one of the greatest golfers ever. Yet, if it’s hard for you to believe, just keep that judgment to yourself especially while you are in the country. Criticizing the former ruler is of course unlawful. Located just the south of the Korean Demilitarized Zone, the course isn’t known as the deadliest golf course on the planet for no reason. The golf destination might be a modest one hole but the threat is very real. Even Kip Henley, a former UN command post wouldn’t be fearless enough to get a ball out of the rough. It’s because beyond the AstroTurf, the course is surrounded by landmines left over from the Korean War. 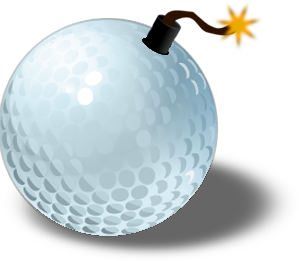 The borders of the green are beset with golfing equipment that is too hazardous to get back – and at least one landmine has exploded by a lost ball. Occupying the top spot for the deadliest golf courses in the world is Harbour Town Golf Links. During the Heritage Tournament in 2012, Kip Henley was caddying for Brian Gay when the latter’s ball stuck in the mire on the fifteenth green. When he went to get the ball back, he discovered it was guarded by a 6-feet alligator. Undaunted, Henley signed up some assistance from a new caddie, Scott Tway, and gently hit the animal with a rake until it departed. 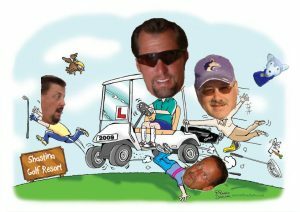 This has been a guest post from Julio Brenes who is the owner of Cesar’s Golf Shop and Rentals – a golf rentals shop serving club renters from different Florida golf courses.